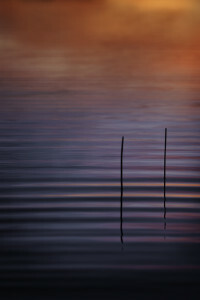 This photograph was created only minutes after Haiku Reeds, and in the same patch of reeds. However, the sun was lower on the horizon by the time I was photographing the two reeds seen here. The color palette of sky and water had fewer reds and more blues. When ripples moved toward and under my camera, I watched the way that streaks of color came and went as they gently rolled. 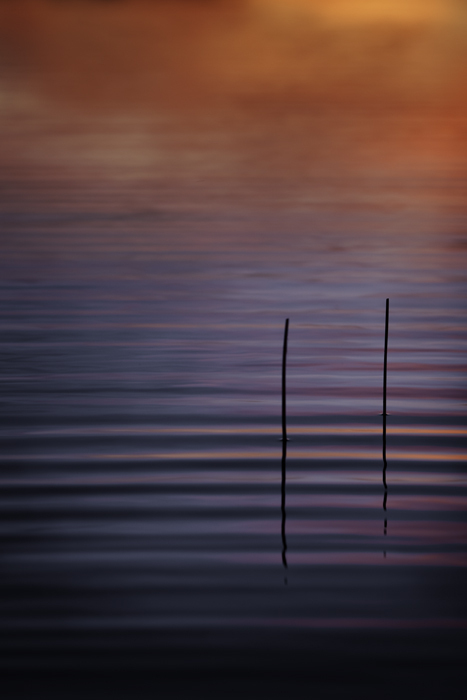 Like Haiku Reeds, the graphic simplicity and rich color of the image, for me, suggests contemplation. Basho was a seventeenth-century haiku poet in Japan. His poetry reflects his direct experiences of nature.